Scribner Book Company, 9780684839769, 448pp. Not so long ago, parsley was the only fresh herb available to most American cooks. Today, bunches of fresh oregano and rosemary can be found in nearly every supermarket, basil and mint grow abundantly in backyards from coast to coast, and garden centers offer pots of edible geraniums and lemon thyme. But once these herbs reach the kitchen, the inevitable question arises: Now what do I do with them? Here, at last, is the first truly comprehensive cookbook to cover all aspects of growing, handling, and cooking with fresh herbs. Jerry Traunfeld grew up cooking and gardening in Maryland, but it wasn't until the 1980s, after he had graduated from the California Culinary Academy and was working at Jeremiah Tower's Stars restaurant in San Francisco, that he began testing the amazing potential of herb cuisine. For the past decade, Jerry Traunfeld has been chef at The Herbfarm, an enchanted restaurant surrounded by kitchen gardens and tucked into the rainy foothills of the Cascade Mountains, east of Seattle. His brilliant nine-course herb-inspired menus have made reservations at the Herbfarm among the most coveted in the country. Eager to reveal his magic to home cooks, Jerry Traunfeld shares 200 of his best recipes in The Herbfarm Cookbook. Written with passion, humor, and a caring for detail that makes this book quite special, The Herbfarm Cookbook explains everything from how to recognize the herbs in your supermarket to how to infuse a jar of honey with the flavor of fresh lavender. Recipes include a full range of dishes from soups, salads, eggs, pasta and risotto, vegetables, poultry, fish, meats, breads, and desserts to sauces, ice creams, sorbets, chutneys, vinegars, and candied flowers. On the familiar side are recipes for Bay Laurel Roasted Chicken and Roasted Asparagus Salad with Fried Sage explained with the type of detail that insures the chicken will be moist and suffused with the flavor of bay and the asparagus complemented with the delicate crunch of sage. On the novel side you will find such unusual dishes as Oysters on the Half Shell with Lemon Varbana Ice and Rhubarb and Angelica Pie. A treasure trove of information, The Herbfarm Cookbook contains a glossary of 27 of the most common culinary herbs and edible flowers; a definitive guide to growing herbs in a garden, a city lot, or on a windowsill; a listing of the USDA has hardiness zones; how to harvest, clean, and store fresh herbs; a Growing Requirements Chart, including each herb's life cycle, height, pruning and growing needs, and number of plants to grow for an average kitchen; and a Cooking with Fresh Herbs Chart, with parts of the herb used, flavor characteristics, amount of chopped herb for six servings, and best herbal partners. 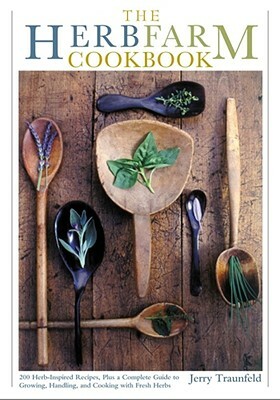 The Herbfarm Cookbook is the most complete, inspired, and useful book about cooking with herbs ever written. -16 full-page botanical watercolors in full color. Jerry Traunfeld is executive chef of The Herbfarm, where he combines a passion for cooking with a love of gardening. He teaches popular classes on cooking with fresh herbs and grows his own supply on a small city lot in Seattle, Washington. For over thirty years I've grown, cooked, experimented with, and been excited by fresh herbs, yet I found this meticulously researched book fresh and inspirational. Jerry Traunfeld's flavor combinations and beautifully written prose are irresistible. I am amazed by the scope of this book! First, it is a great cookbook, full of beautifully conceived ideas and recipes that teach the subtleties of cooking with fresh herbs. Second, The Herbfarm Cookbook is a valuable reference, with helpful charts, line drawings, and botanical illustrations. An outstanding book! How do I use herbs? Which herbs go with what? How do I know which to combine? These, the most asked of all kitchen queries, are answered with clear reasoning and sound intuition in Jerry Traunfeld's The Herbfarm Cookbook. Jerry Traunfeld's simple and honest recipes burst with flavor and will have you rushing to the kitchen to cook and to the garden or window box to plant. A brilliant work, brimful of invaluable know-how and astonishing combinations of flavors. Jerry Traunfeld's book has become an instant favorite in my kitchen and my garden. The Herbfarm Cookbook belongs on your bookshelf. Remarkable and original in the use of herbs, this is not only a collection of sparkling recipes, it is also the best herb reference book I've ever seen. As I read through the pages of this book, I was transfixed by the text and style -- it is rare that one can come across such books that are born from pure passion and translate such excitement and erudition to the reader. I found myself immersed in the undistilled passion of the craft that Jerry has perfected. Anyone interested in herbs or cooking will be delighted by this superb collection of inventive recipes that range from Baked Mussels Stuffed with Mint Pesto to Black Pansy Sorbet. The information on growing herbs and basic herbal cooking techniques is a bonus.